Shopsys Framework (SSFW) is a highly customizable ecommerce framework for businesses transitioning into tech-companies with their own software development team. It contains the most common B2C and B2B features for online stores, and its infrastructure is prepared for high scalability. At Shopsys we understand the importance that reliable infrastructure and constant innovation play when it comes to succeeding online. We have choose modern and proofed technologies (Docker, Kubernetes, PostgreSQL, Redis, Elastic), which support high scalability needs of fast-growing ecommerce businesses. This means you’re able to scale your ecommerce project fast and easily handle all traffic peaks. Choosing out-of-the-box solutions at the beginning can result in technical debt later on. If we think about the extra time that is spent repairing and maintaining software, this can accumulate very quickly. Choosing our product, you save time, money, and energy in the long term, eliminating the need to create a new platform or suffering rewrites while you reach higher traffic and revenue. Because our platform is open source code and has a documentation, any changes within the development team (as people come and go) should not incur any large losses or wasted time spent on familiarizing themselves with a given project. As tech-company, we rely heavily on incorporating new technologies in order to keep learning and improving our skills. The platform is based on one of the best PHP frameworks on the market – Symfony. Your developers will love working with it, and because it features free upgrades, you are always up-to-date. We currently use Shopsys Framework (SSFW) in-house to create custom-made online stores with up to tens of millions of Euros of turnover per year. It is developed and supported by a group of fully dedicated developers with many years of experience in creating ecommerce sites. Because the code of our platform is open source, it also helps to overcome the obstacle of vendor lock-in. Your starting point is far ahead of your competitors, so you can focus on customizations that are unique to your customers. Shopsys Framework is a fully functional platform with basic built-in features like multi-domain, multi-currency, multi-language, product filtering, deployment, etc. SSFW has a modern architecture, which means that future customization (installing modules, providing integrations) can be done quickly and easily. In the near future, we plan to implement a marketplace (with ready-made modules), which will benefit medium-sized projects by helping to save time and costs. There are many articles and cookbooks with suggestions of best practices in our documentation in order to guide programmers through the development process and help them with common tasks. But it’s not only about the codebase. We will share with you knowledge about how to ensure consistent quality through the continuous integration and deployment of important tips and workarounds. 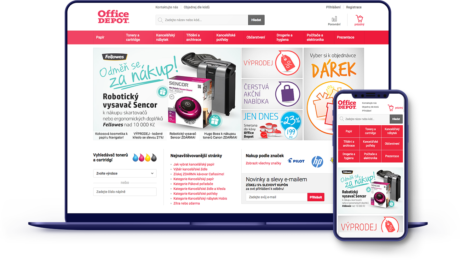 Office Depot is a global leading player in office supplies and Shopsys has proudly been offering support services to them for a number of years. However, their former ecommerce site originally did not entirely fit the Czech market and its specific criteria. Learn more about how we helped them strengthen their leading position on the market by significantly increasing key business indicators and effecting an impressive payback period within two months. Zoopy is a modern B2C e-shop and one of the top ecommerce sites for parenting in Czech, and as industry leaders have continually aspired to grow and expand. In this case study we are taking a look at how those who haven’t had extensive experience using this type of approach were still able to successfully develop their project using Shopsys Framework. Stay current with new and exciting updates about our product and informative articles on our blog. Enter your email and we'll keep you updated on the development of the framework.